Welcome to week 5 of the CHIP IN Education Initiative! This week, let’s expand efforts to educate consumers and small businesses by pointing them to GoChipCard.com. To help, we've created a printable handout you can use at your registers, teller windows and industry conferences. You can share anything here as-is, create your own handouts and resources using the messages on GoChipCard.com, or do a combination of the two! Get started by downloading the free handouts provided below, and pick a few ways that you can share them. Then educate via social media using the recommendations we've provided. Finally, follow our media communications tips when preparing for interviews to ensure accurate reporting on the U.S. migration to chip! 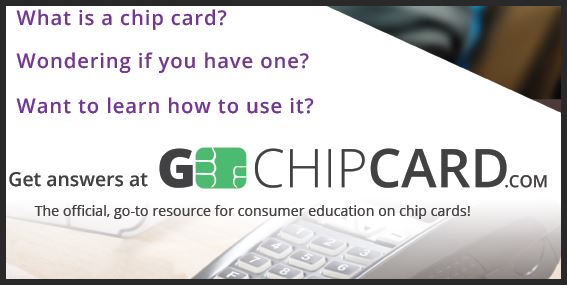 This week, we are featuring downloadable handouts for consumers, issuers and merchants that point to GoChipCard.com as the go-to resource for chip card education. The handouts come in two sizes, so get creative on how to use them! Download the GoChipCard.com consumer handout here, and the issuer/merchant handout here! This week, let’s get the word out about GoChipCard.com as an educational resource for consumers and small businesses. Get the facts about chip cards! GoChipCard.com teaches consumers how to identify a chip card, why they already have or will soon receive these cards for enhanced security, and how to use these new cards in stores and at ATMs. Are you a merchant or an issuer? 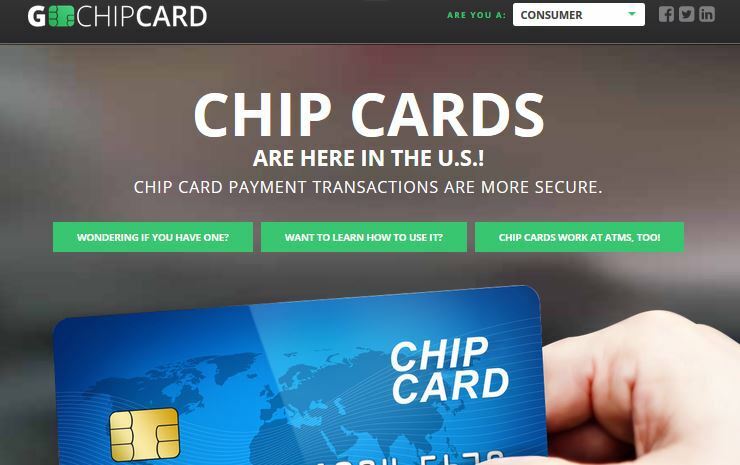 GoChipCard.com has information on issuing and accepting chip cards and downloadable resources for you, too. Why are consumers receiving these new chip cards? Chip card transactions offer you advanced security in-store and at the ATM by making every transaction unique. And, the chip card is more difficult to counterfeit or copy. If the card data and the one-time code are stolen, the information cannot be used to create counterfeit cards and commit fraud. What's different when paying with the chip? Rather than swiping like you do with a magnetic stripe card, the chip card needs to be inserted into the chip-enabled terminal or ATM and left there until prompted to remove. Next week we're sharing an educational video on how to use a chip card in-store and at the ATM!